October 13, 2018 (Sat), 10:00am to 12:00pm. Contact: Bob Brambilla, 703-379-4520, 703-475-7138 or rbtellmewhy@aol.com. This hike is an old favorite! 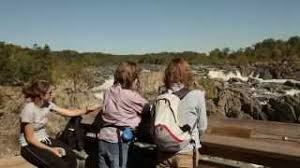 The walk will progress along the canal for a couple miles with walk out to an overlook with magnificent views of Great Falls! Our return is through an upper forested area. Directions: From Virginia, take the BeltwayI-495 over the American Legion bridge to exit 41 for the Clara Barton Parkway towards Carderock/Glen Echo. Turn toward Carderock (to the west). At the "T" intersection where Clara Barton dead ends into MacArthur Blvd, turn left onto MacArthur. Go about 1 mile until you see Old Angler's Inn on your right. Do not park in the Inn's lot. Rather, look for the parking lots on your left, across the street from Old Angler's. We will meet in the parking lot near the building containing the restrooms. From I-270 in Maryland, take either the exit to Democracy Blvd. west in Bethesda or the exit to Falls Road south towards Potomac. (Democracy runs into Falls Road, and turn left onto Falls Road). Falls Road dead ends into MacArthur Blvd. Turn left onto MacArthur, and relatively soon you will see Old Angler's Inn on your left and the parking lots for hikers on your right. DATE/START TIME: October 13, 2018, 10:00 a.m. EVENT LEADER: Bob Brambilla:703-379-4520, 703-475-7138 or rbtellmewhy@aol.com.